Warcraft is not a disaster or deserving of the pre-release negativity. I can honestly say that if you like fantasy, then you're going to like this film. And if you're a fan of the game, then you'll probably love the movie. To be clear, I have never played Warcraft. I walked in fairly cold, knowing the scantest plot details. I did see the initial trailer, but found it spectacularly underwhelming. This is why you have to see the actual movie. Warcraft doesn't spoon feed you. It leaps into the story full throttle. It's a hard fantasy that you have to pay attention to understand. If you do, then you'll be rewarded. The Warcraft movie is entertaining and immersive. The kingdom of Azeroth is being invaded by fearsome orcs. They are coming from their dying world through a portal. The orc leader, Gul'dan (Daniel Wu), has opened the gate using dark magic - The Fel. The human king (Dominic Cooper) sends his warrior brother, Lothar (Travis Fimmel), to face the threat. But the orcs are not what they seem. The mighty, but kind orc chieftain Durotan (Toby Kebbell); sees what The Fel has done to his people. He knows that Gul'dan must be stopped to truly survive. Bitter enemies must find common ground and new allies to stop evil. Warcraft cannot be judged purely on the visual effects. They run from borderline video game CGI to impressive theatrical quality. It's not entirely consistent throughout, but that doesn't take you out of the story. Azeroth is fully realized as the setting. I liken it to watching old episodes of Star Trek. Yes, some things look unrealistic, but you still believe they are in space. That's an apt analogy. Director Duncan Jones, who's taking way too much heat from the haters, successfully creates Azeroth. He took a stab at adapting a vast world and succeeds in his efforts. The plot and characters in Legendary's Warcraft are very detailed. It would be an understatement to say there's a lot going on. Casual watchers will get lost if they're not fully committed. I found the story to be engrossing. It was not a strain to follow the characters and comprehend what they were doing. In fact, the actors do a pretty good job of selling the drama. Some parts lead to obvious resolves, but I was quite taken by the ending. It's a satisfying conclusion to the story. There isn't a boring second in Warcraft. The dialogue gets silly at time, but not enough to derail the pacing. It's also wall to wall action. Then you have the mystical element that I thought was pretty cool. Once again, Warcraft doesn't stop to explain every point about the magic being used. You have to watch, listen to the characters interact, and infer what they're trying to do. It takes a bit of imagination to be on the Warcraft ride. Warcraft needs to be seen. Judge it for yourself. I was captivated for the entire runtime and would see a sequel in a heartbeat. It's a rollicking fantasy adventure that's getting a bad rap. Duncan Jones went big and is being pilloried unfairly for it. Warcraft isn't stupid or hard to follow. It's a skydive into a fantasy world. 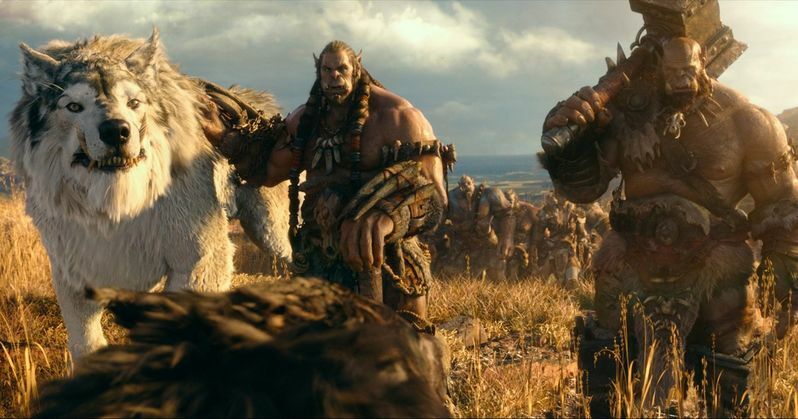 Warcraft is definitely worth shelling out for the IMAX 3D.